On our travels along the gorgeous Vecht canal (see our earlier blog) we were surprised to find a lovely tjalk (Dutch barge) coming alongside us as we were moored at Hinderdam. It turned out the tjalk was owned by Joop and his wife – they had a problem with their engine and tied off to Endellion to let it cool before heading home not far away. In conversation it turned out Joop is a painter .. fancy that, we had been trying to find a painter for our roof since our winter in Paris. The boat builders had neglected to put any primer or undercoat on the entire roof, they just slapped one coat of paint on and then fitted all the handrails, ventilation units, etc and sent us on our way. The roof is now nothing but rust and we have to remove all of the fittings and start again. It needs a professional .. and finally, by happenstance, we found the man for the job! 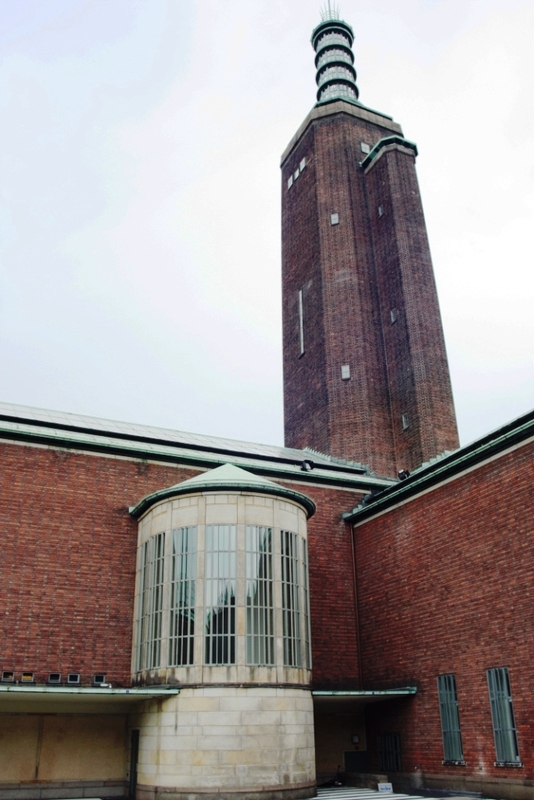 So our plan from Amsterdam pivoted around repainting our roof – work will start on the 5thSeptember (at least one week’s worth) and will be done at Weesp .. a delightful place to spend more time. Map from PC Navigo showing our Amsterdam circuit. Amsterdam back to Weesp (for painting and repair meetings) this time back out across the Amsterdam harbour through the Oranjesluizen (lock), along the Buiten IJ into the IJmeer (inland sea) and across to the Vecht at Muiden, a few kilometres from Weesp. 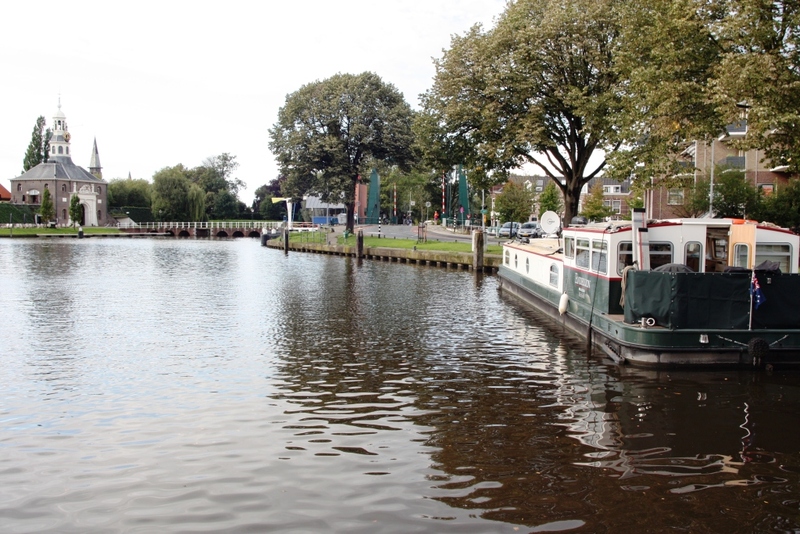 Weesp to Nieuwegein the ultra-quick way, up the Amsterdam-Rijn Canal and into the Merwede – a rough ride but faster than the Vecht. 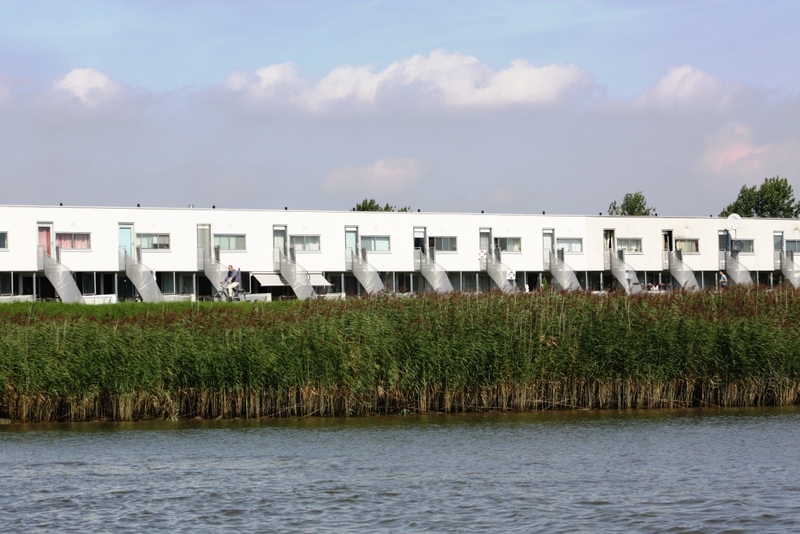 Nieuwegein to Gouda – along the fantastic Hollandse Ijssel. 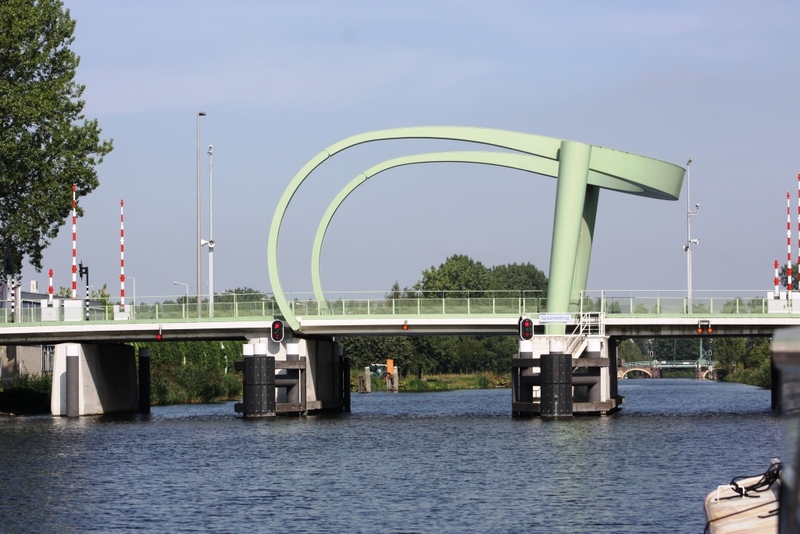 Gouda to Rotterdam – using the ever-widening Hollandse Ijssel until it flows into the faster-flowing Nieuwe Maas and turning up the Delftshavense Schie canal near the city centre. Rotterdam to Leiden via Delft using the Reijn-Schiekanaal. 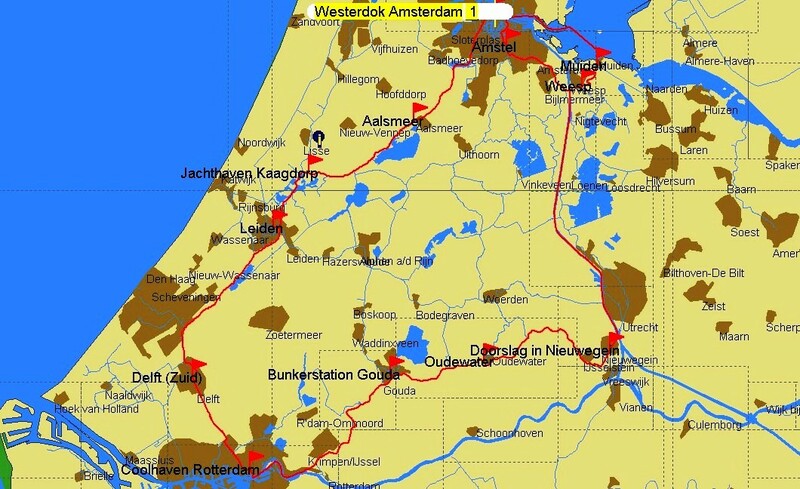 Leiden to Amsterdam via Kagerplassen (lake), along the Ringvaart van de Haarlemmer-meerpolder (we won’t make it to Haarlem this time), across the Westeinderplassen to Aalsmeer, along the Schinkel of Kostverlorenvaart into Amsterdam’s outer harbour around the point and into Westerdock (our Amsterdam home). 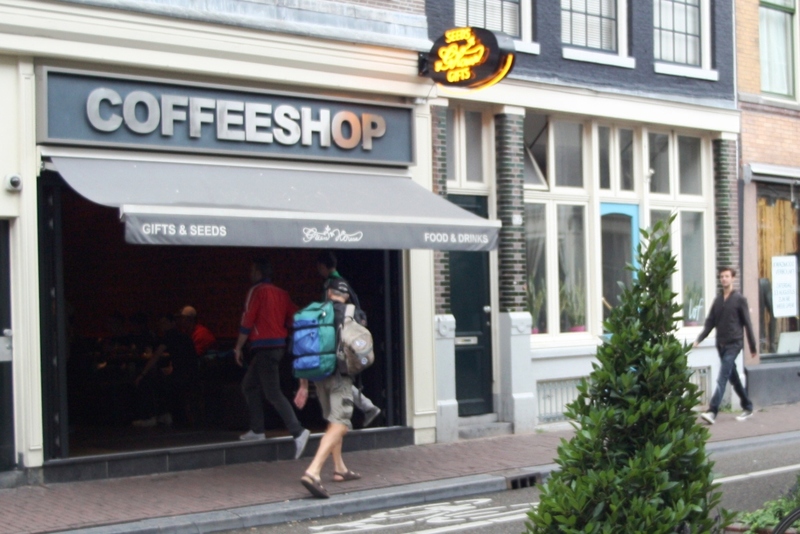 We love Amsterdam – as you will know from our last blog. Walking past the 'Coffee Shop' is best done on the other side of the road! The museums, our ‘village’ of Jordaan, the endless beautiful canals lined with ancient buildings tilting this way and that, the classic churches .. the overall atmosphere – even though we have to tolerate the relatively frequent whiff of something smoky and sickly as we pass the ‘Coffee Shops’ (yes, marijuana or stronger is available it seems but confined to specific ‘shops’ who may also happen to serve coffee). 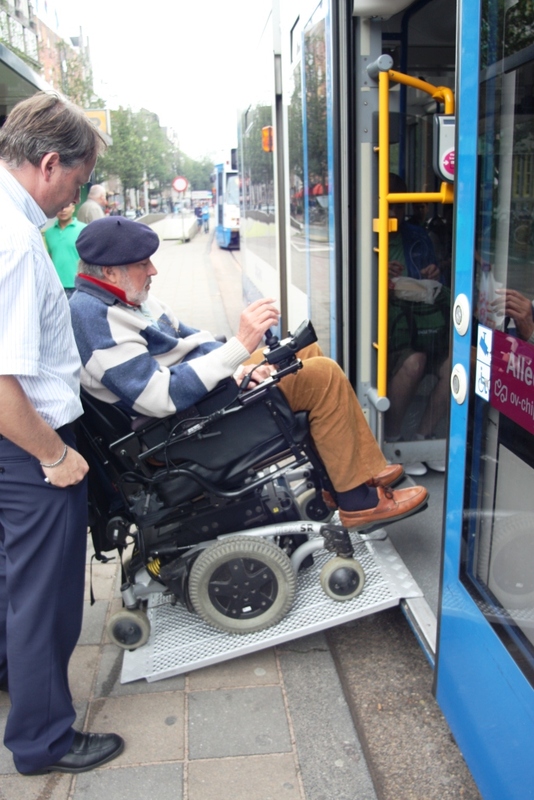 Amsterdam for us is very accessible .. the one slight challenge is using the buses. Stewart finally heading up the steep ramp into the bus, from the narrow waiting platform. Most of them have a steel ramp which is manually dropped by the ‘conductor’ .. the challenge is where they drop it. The bus stops often share space with the tram stops and these are on a small island in the middle of the road. The space for Stewart to turn onto the dropped ramp on the island is usually so narrow he has to approach the ramp from the side which is very difficult. When disembarking it’s the same in reverse, ie, he often has to go down the too steep ramp, drop down the pavement step and into the road as the island is too narrow to contain the ramp and the wheelchair. Needless to say .. the ‘can do’ attitude of Stewart and his hero TDX meant he always made do. Before Mary left us for the south of France we had a busy time, one day joining a guided tour on the subject of World War II and the Holocaust, starting at the Anne Frank house. This was where Anne’s father (Jewish) hid seven members of his family and friends but they were betrayed after two years and sent to Auschwitz in August 1944. Amsterdam was occupied by the Germans during the war and as we toured the streets we were reminded of the horrors of war once again .. as Stewart said in his ‘Radio Endellion Gay Parade’ video, it wasn’t only Jews (10% of Amsterdam’s population at that time were Jewish) who were sent to the death camps, also homosexuals, the disabled and of course political protestors. Thankfully our spirits were greatly lifted immediately after the tour when we met up with Paul and Kien Honen who live in Amsterdam. Paul was an old schoolmate of Stewart’s from Canberra Grammar – the last time Stewart actually saw Paul was 43 years ago, the last year of school. On our own again we headed back to Weesp to meet with Joop (our painter) and Marco (for general boat repairs and maintenance while the painting is being done). 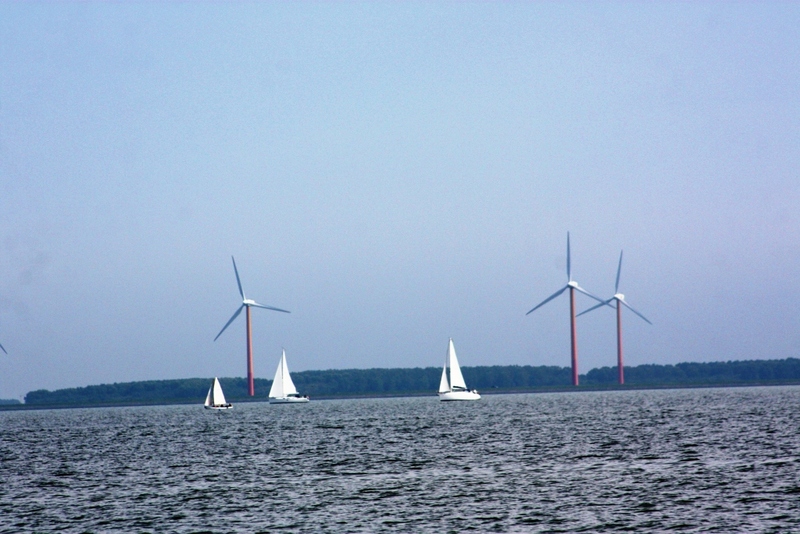 The IJsselmeer - more suited to sails. us because he wanted us to give him more room. The only way to do that would have been to tie off on the side of the tiny dinghy ahead of us .. not possible! We all made it in one piece despite this .. and thankfully we pottered on through the open gates and soon were left behind as we headed out onto the lake .. everyone in such a hurry in these parts. The Ijsselmeer (or IJmeer) is vast and enjoyed mostly by sailing yachts with a significant keel beneath them, it’s not really for flat-bottomed barges like ours. The weather was good, not much wind, the water therefore relatively flat so we had a great crossing back into the Vecht canal at Muiden. 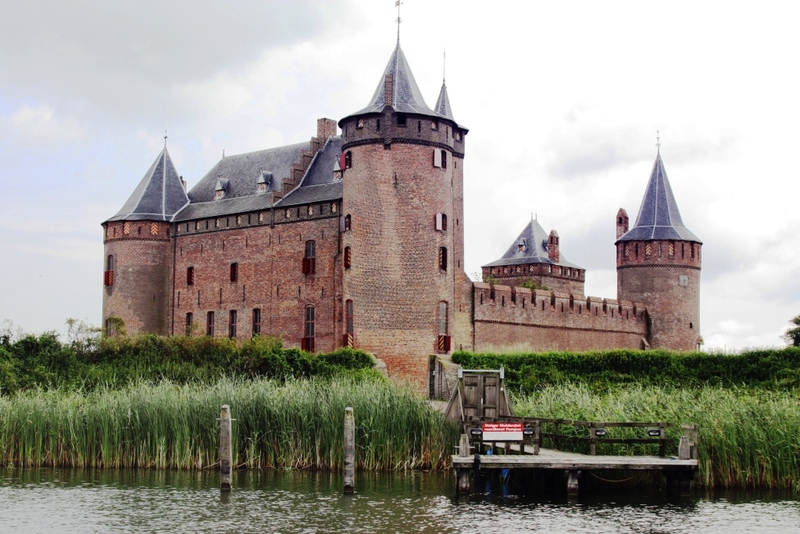 Coming in off the IJsselmeer into the Vecht, couldn't miss the castle. 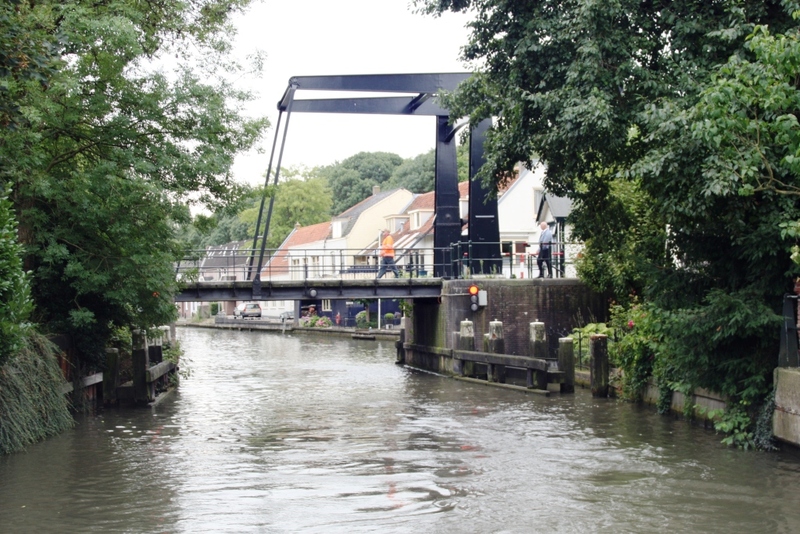 Once into the calmer, narrower waters of the Vecht we were reminded that we were still in the school holiday period .. everywhere was frantically busy, boats jostling for moorings and positioning for first place in the locks and at lift/swing bridges – very entertaining. We wondered if these skippers think if they hurry more and are first everywhere they will have more holiday time! 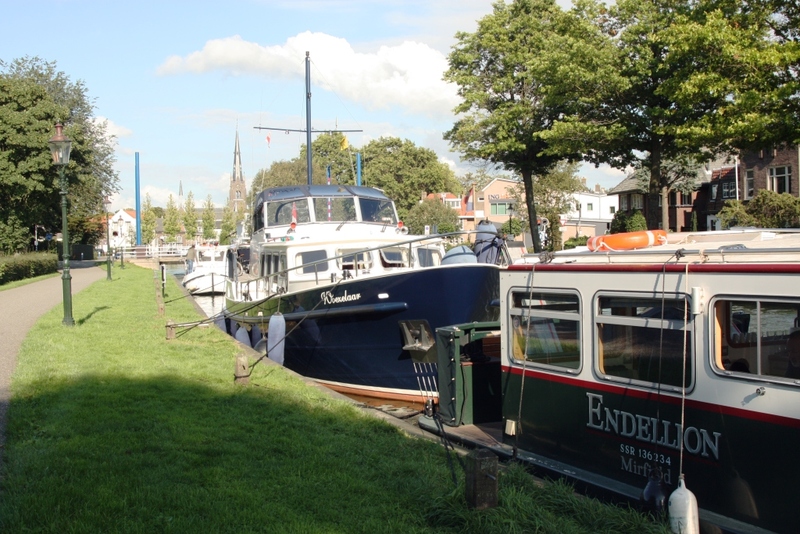 Endellion moored on the Small Weesp canal with Hank's speedy cruiser behind us. 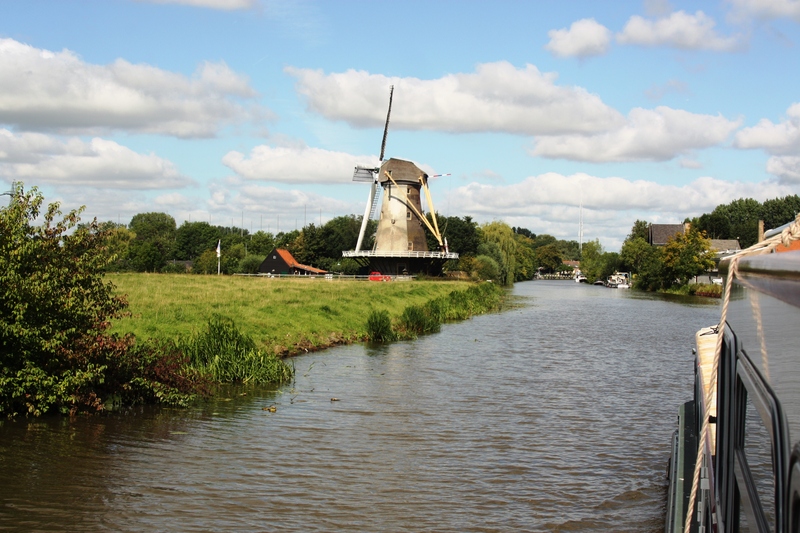 At the now very familiar town of Weesp we met up with our painter and repairer – and one very important immediate job was to change our fuel filter (again) as we could see more black muck in the bowl – bacteria. That done we headed south again into ‘new territory’. The beast overtakes us leaving water splashing into the engine hold. We were familiar with the Amsterdam-Rijn canal having crossed it on our way into Amsterdam .. but now we had decided to use it to make a quick run south to get to the Hollandse Ijssel (recommended to us by skipper Hank, who moored next to us at Weesp after an amazing performance of extremely fast manoeuvring in his big cruiser). 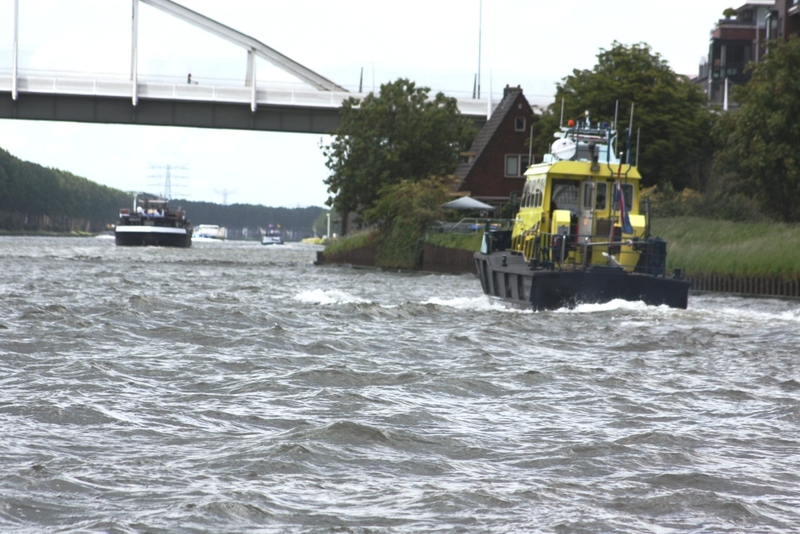 Choppy water along the Amsterdam-Rijn canal. Well .. the major Amsterdam-Rijn we knew was a bit choppy but going the 20 odd kilometres up it with massive commercial barges all around us was discovering what rough water meant. By the end of it we had taken on quite a lot of water in the engine hold, which came in through the air vents as these mighty commercial beasts passed us close by, at twice our speed, spraying water everywhere, and to our horror we found the entire fuel filter (a new element fitted that morning) was now completely black with muck. (obviously sucked up on our very rough ride down the Amsterdam-Rijn) and insisted we wouldn’t have any more problems so no need to empty our fuel tank and start again. any bugs), which Jan now told us was a total waste, “throw it in the bin”, he said. This time, we realised (with hindsight) the dirt must have been from the Heusden bunker-barge where the pump operator had to change bowsers as we had emptied the first one. We now get the idea: If it’s the bottom of a fuel bowser (what luck to have this twice) we will get the dreaded muck. 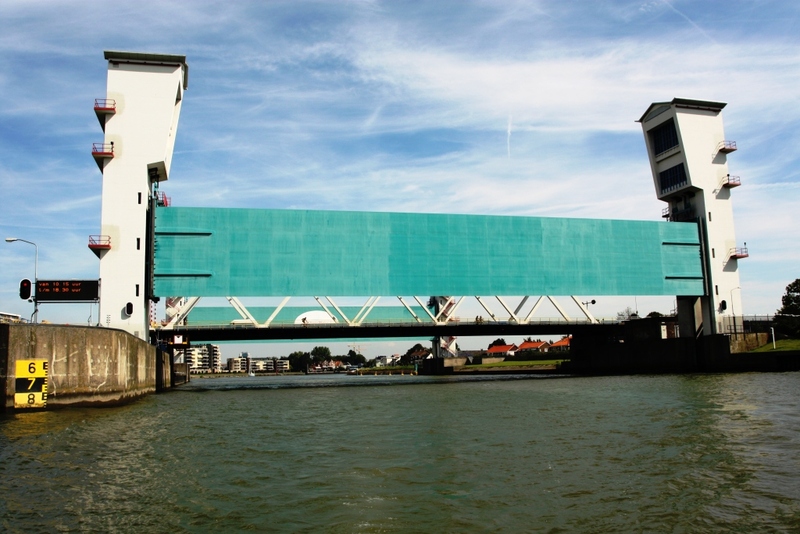 So we are planning on installing double filters when back in Weesp .. another thing to add to our long list of things to do. Lovely green stretches of the Hollandse IJssel canal. Quiet and beautiful stretches of the upper Hollandse IJssel. With a relatively healthy boat again we headed along the same few kilometres to be back on track for Oudewater, a gorgeous town crisscrossed by small canals quite like Utrecht, and then into one of the loveliest towns in a while, Gouda. Coming into the harbour at Gouda we pass the Maritime Museum, open air. 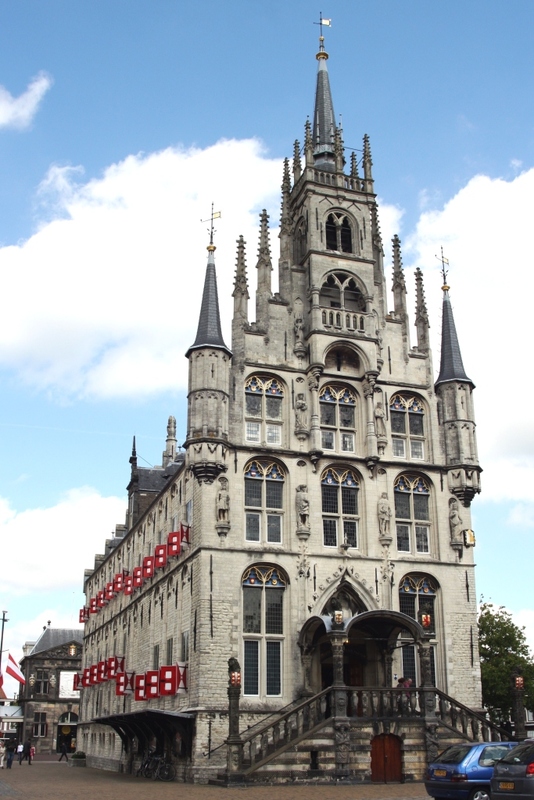 The town hall at Gouda. Famous for its cheese of course but in fact it has so much more to offer .. in particular we loved St John’s church with its famous stained glass windows, 60% of all of those in the Netherlands. Many from the mid-1500s .. wow, what stories they tell. Touring town we could hardly believe our eyes when we came across the most striking and stylish Town Hall, 16th century .. weddings taking place regularly as we noted. And the Waag (weighing house) for the famous Gouda cheese – a classic building although not accessible which is inexcusable as it would have been easy to put in a ramp. 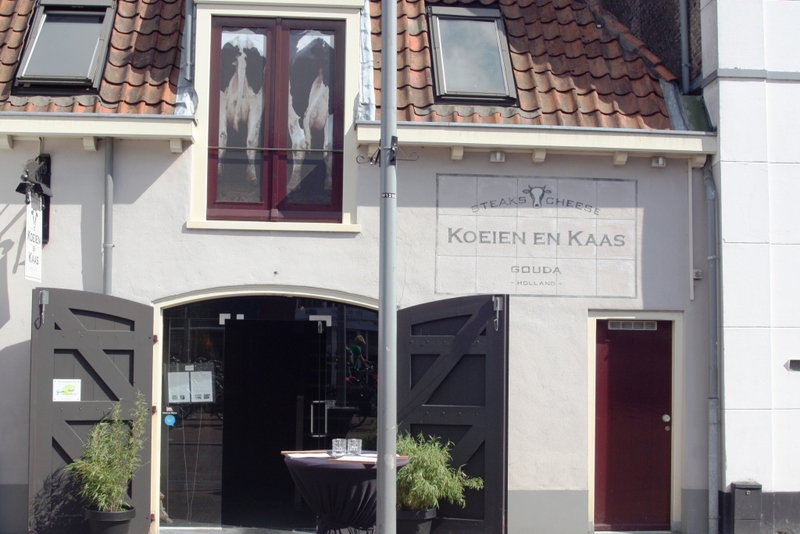 The excellent 'Cow and Cheese' restaurant in Gouda, note the image above the door. And a special treat .. we came across a really interesting restaurant, the ‘Cow and Cheese’ (when translated) and here they served the perfect steak, as you’d imagine, so good we didn’t even have any cheese to follow! 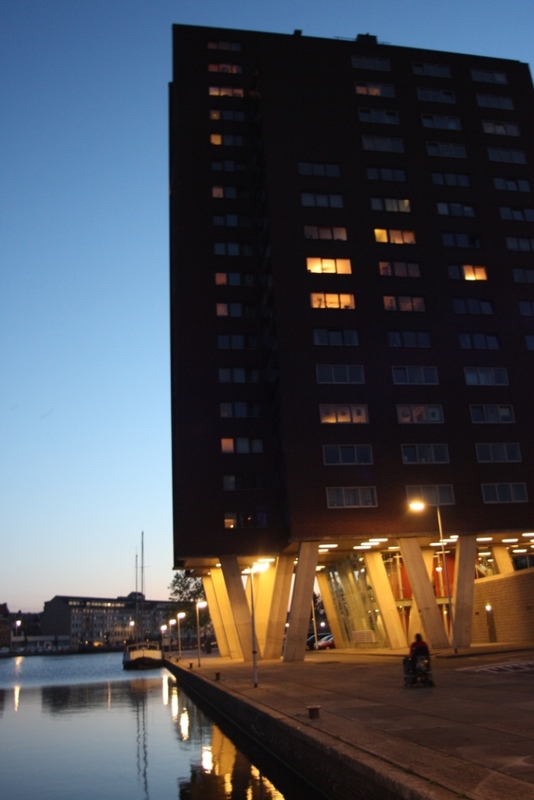 Many modern apartment buildings stretch along the canal coming into Rotterdam. The next day (we should have planned a longer stay at Gouda) we went back into the Hollandse Ijssel canal (there’s one lock and lift bridge in and out of Gouda) to continue on a long stretch of wide and relatively calm water which finally took us into the Nieuwe Maas for Rotterdam – the second biggest port in the world apparently, the biggest in Europe anyway. 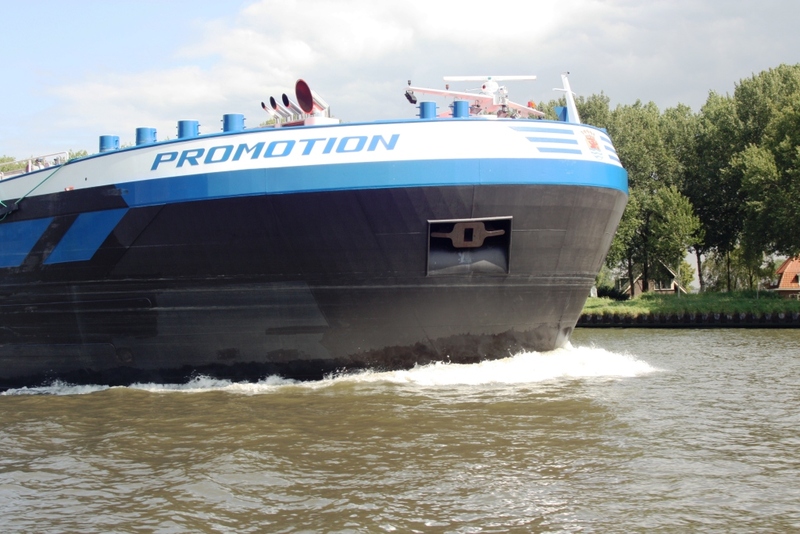 The Algerabrug - part of the Hollandse IJssel storm system coming into Rotterdam. On the Maas we again experienced a very rough ride, a bit like the Amsterdam-Rijn, and worried about any remaining dirt in the fuel being sloshed through the filter. 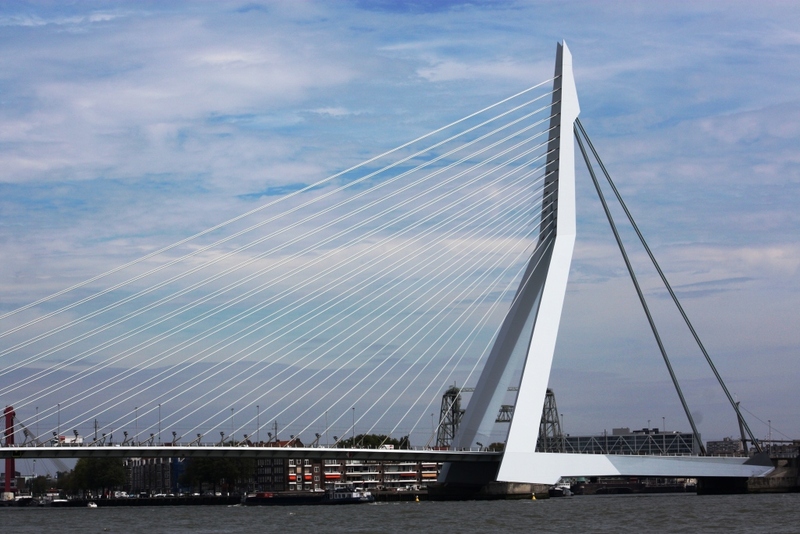 Erasmus bridge, a classic structure, Rotterdam. It’s so wide there seemed no danger of being in any commercial ship’s way. Our plan, having previously telephoned the very busy harbour master, was to moor at Veerhaven, close to the city centre, and this is where we headed. We were on an out-flowing river running at least a strong three kilometres per hour which made it doubly difficult for Stewart to bring Endellion in to the relatively narrow Veerhaven entrance where it was also very choppy. He had to put on big revs to stop going down river and then we faced a sailing yacht coming out who kindly beckoned us in as he waited. Phew, we could enter the relatively calm marina and the yacht motored out past us. We could then see the harbour master calling to moor to the side of the big barge we were approaching. “But my husband can’t get off there” .. do as you’re told was the instruction, so we had to obey. He came over to the side of the barge and we could explain the wheelchair – his first response was that it was easy to get off over the top of the barge. Well no.. considering we were about six feet below its deck and there was only a narrow walkway from there to shore! Endellion moored at Cool Haven in Rotterdam, John's old converted commercial behind us. So out onto the frantic Maas again but not far and in through the Parksluizen lock and to our great relief the huge Cool Haven offering heaps of mooring space although with no electricity or water. And here is where we met John, living on an ancient converted commercial barge moored ahead of us. John was extremely helpful giving us all sorts of advice about getting into the town centre, where to eat and what to see and do in Rotterdam. He has done all sorts in his life but his main passion when he can get it is working as a Roadie. He has hundreds of t-shirts from the various tours he has worked on which he frequently changed into during the two days we saw him; for example, Peche de Mode, the more recent Kylie Minogue show in Amsterdam, Eric Clapton, Whitney Houston and countless Rolling Stones concerts. He said he was Keith Richard’s gofer for nine months .. we believed him, especially when he showed us the red Mick Jagger lips tattoo on his upper arm. John was also a Paint Standards Inspector .. truly. He volunteered this information before he saw our roof.. and when we said, well take a look at this.. he was furious. If only the builders were accessible to him he would have made it very clear to them what he thought! He couldn’t believe that any builder would be so dishonest as to put one coat of paint on a new boat and pretend all would be well. He had many an interesting tale to tell .. we hope to see John again one day. We loved the Boijmans van Beuningen art museum, a lovely 1930s building with a wonderful collection of works especially Old Masters. Stewart studying the real Bosch painting at the Boijmans museum. 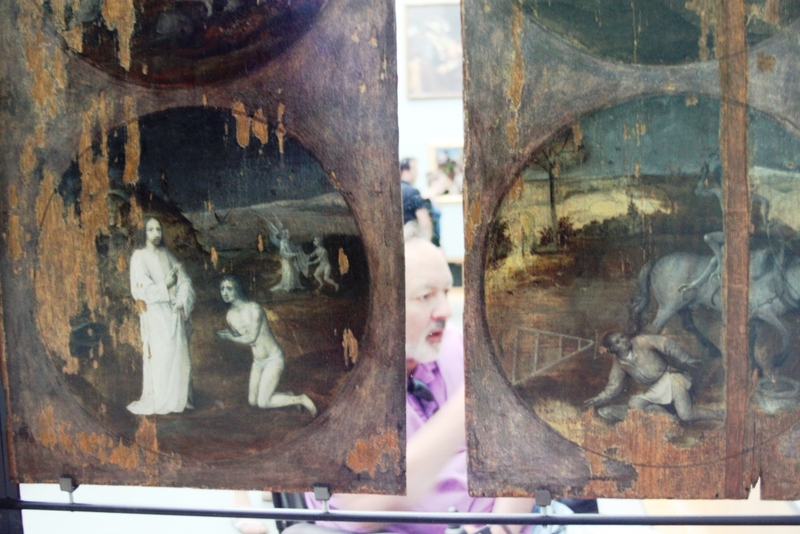 We saw the originals of the Hieronymus Bosch we’d seen replicas of in our favourite town of Den Bosch, his birthplace. 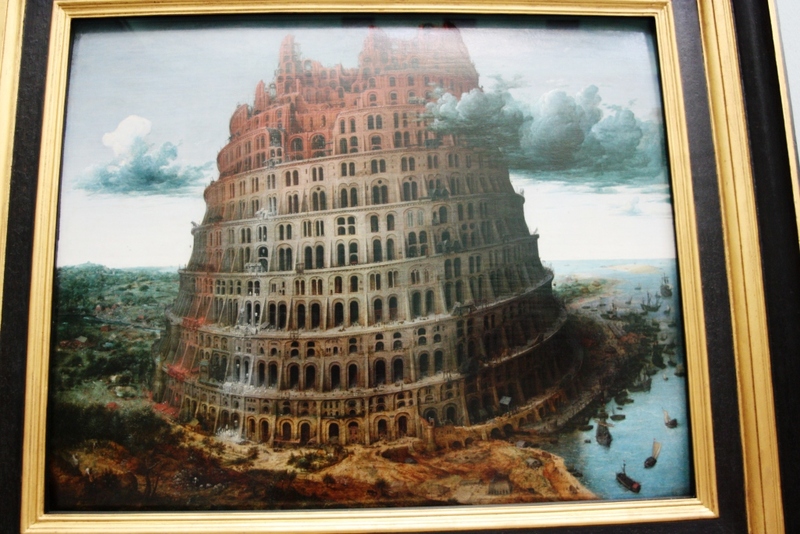 We saw Van Eycks, The Tower of Babel by Bruegel the Elder, and Rubens. 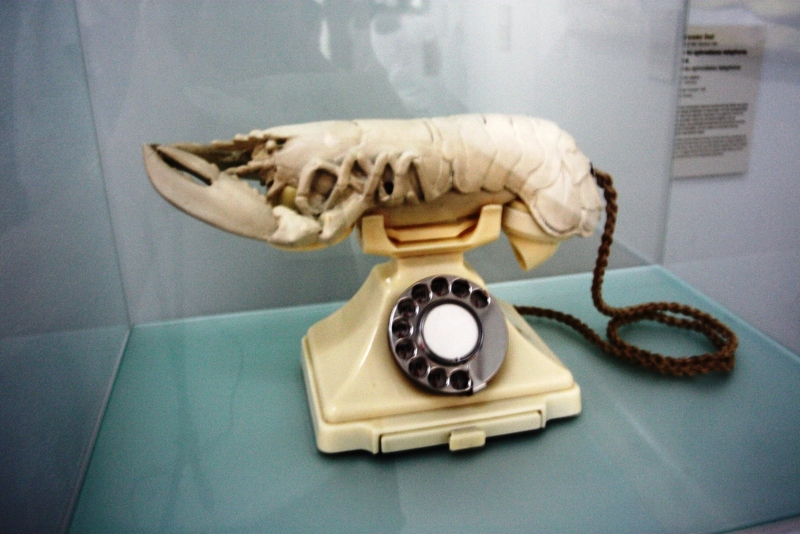 Who else but Dali could have created this? 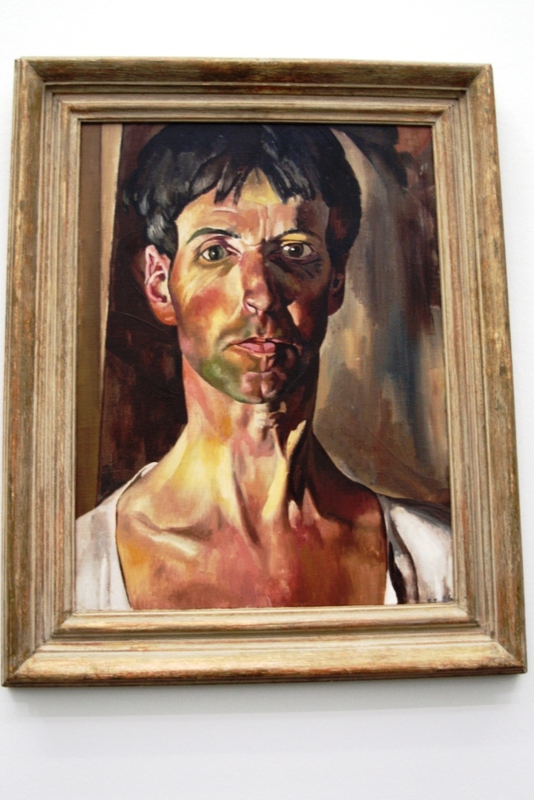 Stanley Spencer, self-portrait, at the Boijmans museum. They also had an excellent Modern and Contemporary section with works from Van Gogh (some of his early works), Degas and Surrealists like Salvador Dali and Magritte .. and Stanley Spencer (who we discovered at Cookham back in our River Thames days) was on display .. we were exhausted before we’d seen it all. 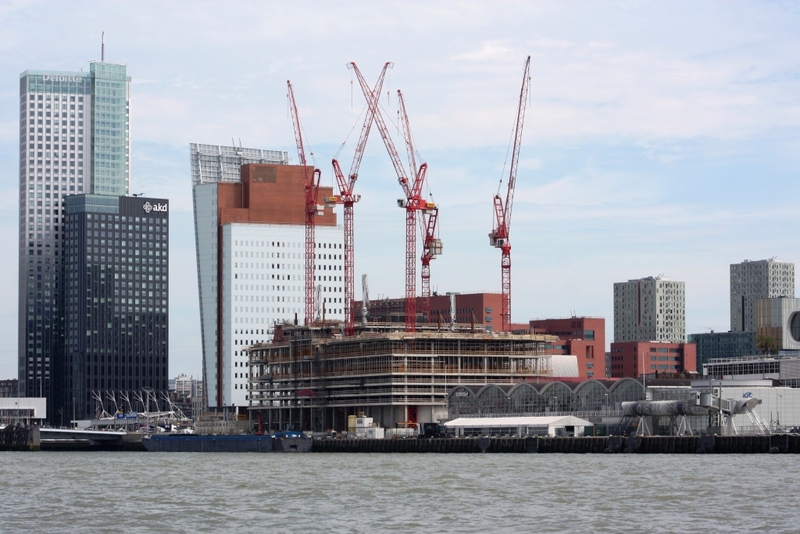 Other than the excellent Boijmans museum and meeting John, Rotterdam is one of the few places we have found in the Netherlands where we were disappointed. There are so many multi-national brands of fast-food, coffee and clothes outlets we could have been in any country (think Los Angeles, sadly we could say even parts of Sydney). 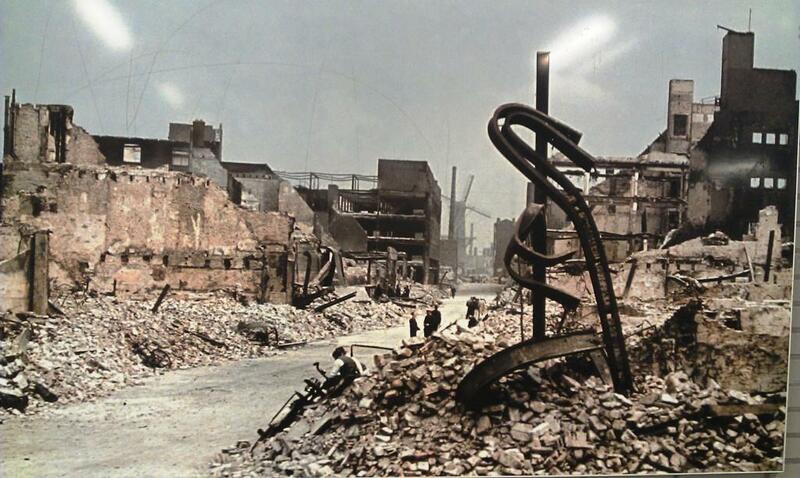 Copy of a photo showing the total destruction of Rotterdam by the Germans in WWII. Stewart heading back to Endellion after our night out in Rotterdam. find them), good restaurants. Needless to say we moved on quickly heading for Delft – only about 12 kilometres along the quiet Reijn-Schiekanaal canal. 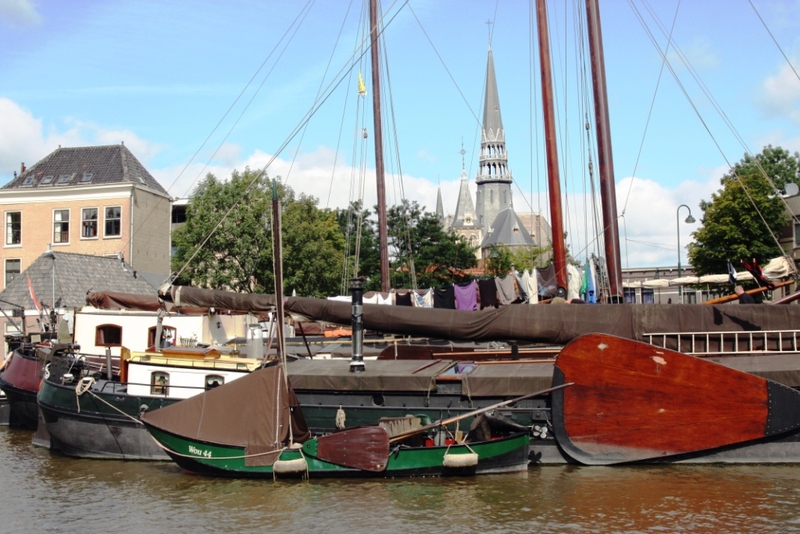 Unfortunately Delft was also disappointing.. a beautiful town but the moorings and the experience we had with the harbour master were not good…. The pleasure boat moorings were new but with steps up, ie, inaccessible to us and the commercial boat mooring adjacent was accessible but despite being told by the bridge keeper we could moor there the ‘harbourmaster’ went blue in the face and jumped up and down shouting at us as we attempted to move into the empty and accessible mooring. Never mind.. we have found so many wonderful towns in this country, we had one night there at a free mooring out-of-town and were happy to move on. 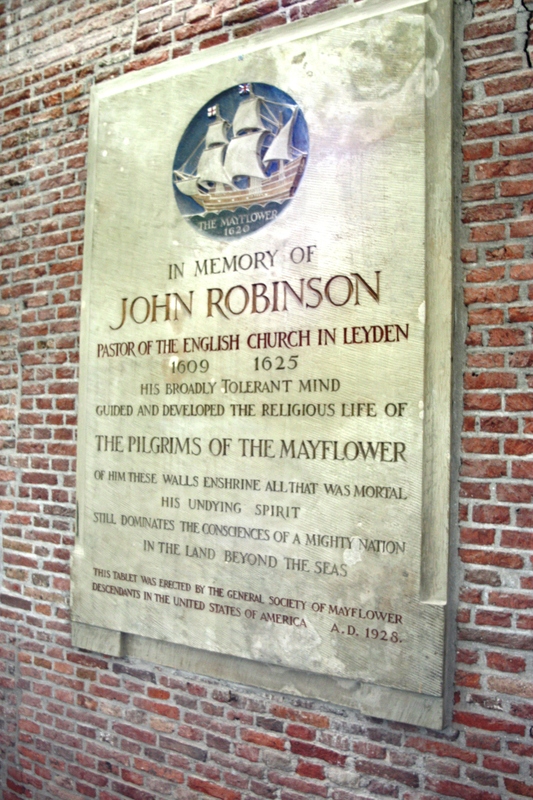 Plaque remembering John Robinson of the Pilgrim Fathers. We headed on to Leiden, 26 kilometres away, although it took us most of the day as we also had 14 lift or swing bridges to ‘negotiate’. 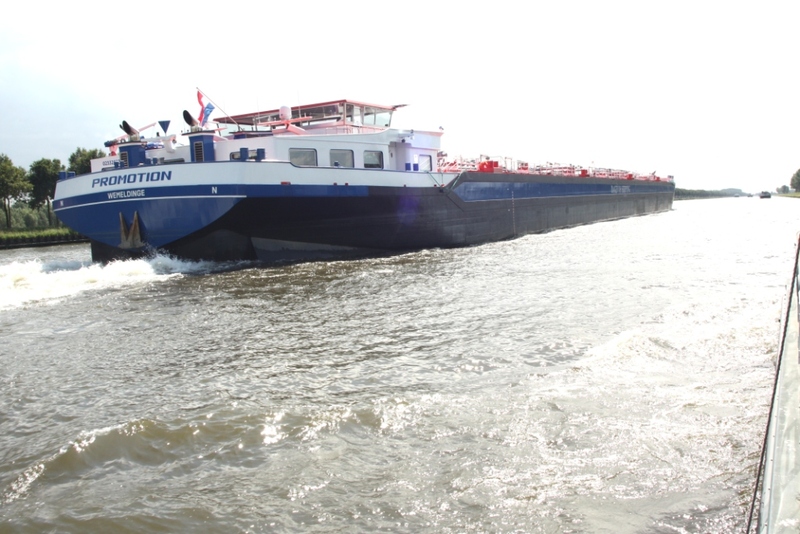 We are a little more cautious with these sometimes optically challenging infrastructures since we took our bimini off with one of them coming into Amsterdam! We have found we can’t trust our eyes, computer software (PC Navigo), or the printed maps (ANWB) or even the sign they place on the bridge – and we can’t trust our ‘official’ air draft we were told by the builders. All of these sources usually have a different height measurement, and the official builder’s measurement of 2.36 meters is definitely not correct. commercial barge somewhere) we still have some space to move. This 2.7m limit we have set is easily assessed by watching the aerial with St Piran flag (Cornish), way down on the bow, bend as far as half-way down the flag.. that’s the limit. Another "will we" or "won't we" fit under without lifting it? So with agreement on what height we were.. we had to wait for several bridges to open for us .. one taking almost an hour before we could get a response from our radio call to the bridge keepers located somewhere looking (or not looking) at their CCTV screens. Finally we arrived at Leiden .. and as expected, we loved it! We had telephoned ahead and the bridge keeper’s office said, “Yes.. no problem with wheelchair access”. When we entered the town through the final lift bridge we were directed to one of the best moorings possible – in the commercial boat section – with perfect access straight from our boat, and electricity and water right beside us. Plus ..we were on our own, we didn’t have to sit in the pleasure boat section which was chocker block with cruisers all stacked so tightly it’s similar to being in a Sydney city traffic queue at peak hour. The town was gorgeous .. like Delft .. but Leiden can boast it has the ‘oldest’ university in the Netherlands, and is the birthplace of Rembrandt. It was in this town in 1609 that almost one hundred English Puritans settled, led by John Robinson. This group, the Pilgrim Fathers, eventually sailed to America on the Mayflower via Plymouth. A bit of a west country connection. Endellion at the commercial section of Leiden harbour - perfect. where there was an excellent Italian restaurant with Wi-Fi and the delightful central public library. Four days in this lovely town and we hope to return one day. On the move again .. only a few more stops and we’ll be back in Amsterdam. 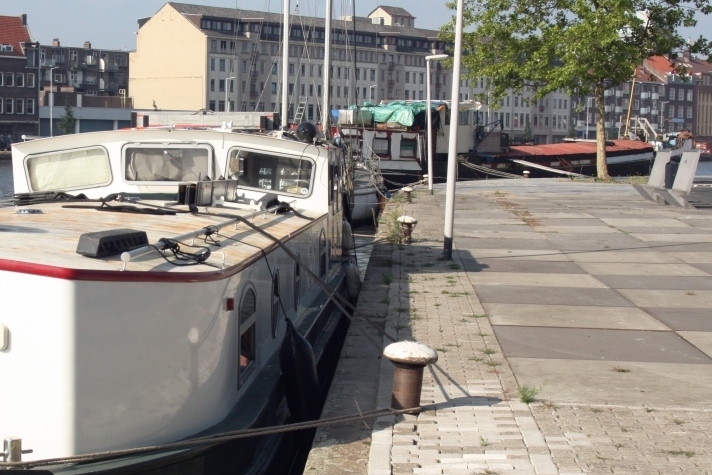 This entry was posted in Accessibility, Waterway life, Waterway services and tagged Endellion barge, MS, Netherlands, Travel, Waterway services, Wheelchair access. Bookmark the permalink. So am I. I just finished reading it at the same time as John did. Hi Margaret .. it’s been busy lately! We hope to slow down, and we won’t have much to blog about! Hope you’re both in great health. Is there to be no end to this amazing journey? Loving it. Hoping to give you a rest from reading as we are going to be slowing down, if I can get Stewart to relax that is!